It happens sometimes to find, by chance, a group of enthusiast people that, when they discover Concrete Shelves, they just fall in love with the idea of sharing some photo of the records they own. It just happened with the Cassette Hoarders United, a Facebook group devoted to this hissing media. Here are some of the pics they wanted to share with us, and a related brief conversation with four of their kind and incredible members. These covers are amazing! Is it you that did them? Or something is ‘official’? Are these compilations you do or full albums? Nice to see Sinead O’ Connor beside the yawning face of a horse! Yes I made these except the Spring Rolls bottom right. I use to love making inserts for cassettes usually with some sort of theme related to the music. I was right into Industrial/avant-garde music in the ’80s and a lot were inspired by this genre. I will photograph some more if you like. Cool. I’m a fan of industrial too, and I like collages. You might check out Michael Leigh stuff. He was involved, as Vittore Baroni, in the mail art in the 80s, along with people like Genesis P-Orrige. So please, do send a pair of other pics if you like! What are “When twenty million died” and “Portrait of a Cockroach”? “When twenty million died” was from an article about the plague and has industrial music on it… “Portrait of a Cockroach” is exactly that! The cover is a photo of a cockroach from some newspaper item. Pat Butler is a collage artist and music collector from Sunshine Coast, Queensland, Australia. This is one of the weirdest pics I’ve got for Concrete Shelves. Congratulation for the huge impact. 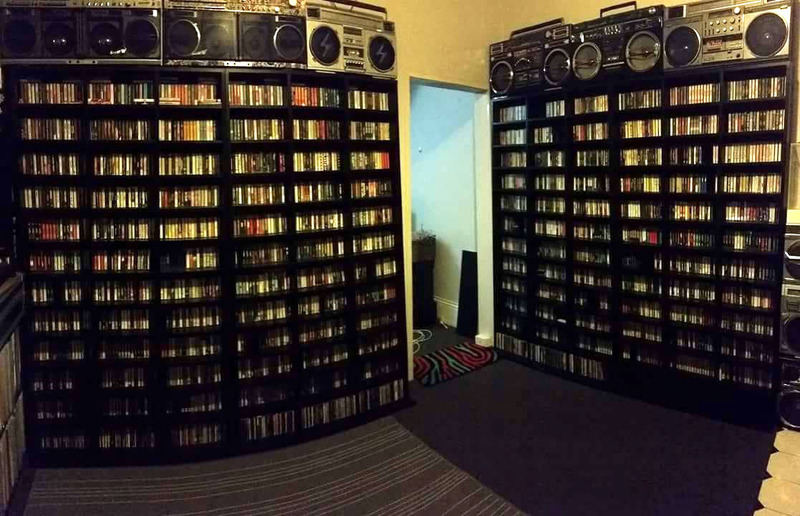 So you collect tapes and radios? Are those cassettes dubbed ones or originals? Does anyone but you dare to get into this room? Wow. Boomboxes are something I know by name, but I always relate it to rap or street music. Are you involved in such things? You sing/play? I DJ rap and hip-hop music and am pretty involved in the worldwide collector scene. 95% of my tapes are rap. It’s a wall of records, but you also have interesting machines there. You have different tapes recorders, right? What are the ones at the bottom, in particular? It’s funny how the TV set looks just totally out of place here! It’s not often someone wants to discuss cassettes, usually people ask about my record collection. That being said, hello Matteo, nice to meet you. I’ve been collecting records and tapes since I was a child. I am 50 and I have pieces in my collection from when I was about 5 or so, plus I have both of my brothers records as well as my mom’s collection and even a few from my grandmother. My wife thinks it’s out of control, but she is the best wife ever. If you multiply that times ten (10 songs on average per album), I am sitting with over 250,000 songs. Plus Thousands of music-related Laserdiscs, DVDs, CEDs, sheet music, music memorabilia, wall art, 2000+ 7 inch 45s, ect. My equipment ranges from modern stereos and amps, to vintage Hi-Fi. My picture shows my Marantz 6300 turntable, Tascam 302 cassette player, and a Sony DAT tape machine, my reel to reel player is a Akai, I have better reel to reel players than that, but that’s the only one small enough to fit in my entertainment centre. The two Panasonic rs808 8-track players I picked up on a road trip with my wife. They are cool even though they’re mediocre quality, because their serial numbers are one digit off, which means they have been married their whole life, one ends in …26 and the other ends in …27. I enjoy talking about my life long love… music. Mate, this is incredible! Your wife seems to be very patient. Does she have another similar addiction? And, among all these music pieces, which are the ones she likes the most? And you? Which are your favourite bands? Yes, my wife does have her own addiction… she loves Baseball and Football, and all the memorabilia that can be related, like authentic pictures and prints, autograph Baseballs and autograph Baseball Bats. A few years back I bought her a ‘First Base’ so yeah, she has her own addiction. Our house looks like a museum of music and sports. My musical taste is all over the place, but I mostly listen to New Wave, Punk, Post Punk, Rock, some traditional Country, and even some Jazz, there is nothing better than Coltrane on a Sunday morning. My wife likes a broader range of music, and she goes for a more Pop style music. My favourite bands are: Echo and the Bunnymen, The Cure, Ocean Blue, New Order / Joy Division, Ramones. My wife’s favourite bands are: Maroon 5, Bruno Mars, Jason Mraz, Echo and the Bunnymen, The Cure. 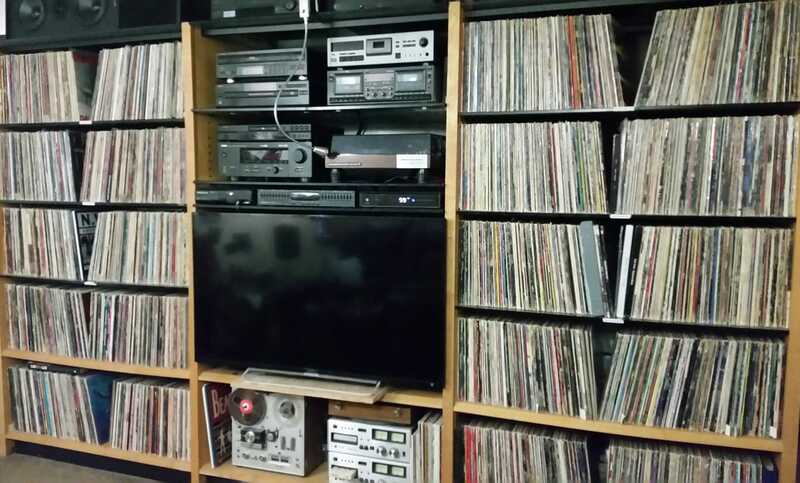 I should add that my wife doesn’t mind me bringing home records or cassettes or CDs, her problem she has with me… is me bringing home stereo equipment, I have well over 250 pieces of equipment and I’m always swapping gear out. Plus there are complete stereos in ALL the rooms of the house. Life Is Good. Take Care. It seems that you kept those boxes full of cassettes out from some hidden place in your sleeping room, right? You keep listening to them, or they’re just relics of your past as a boy? When did you purchase them? 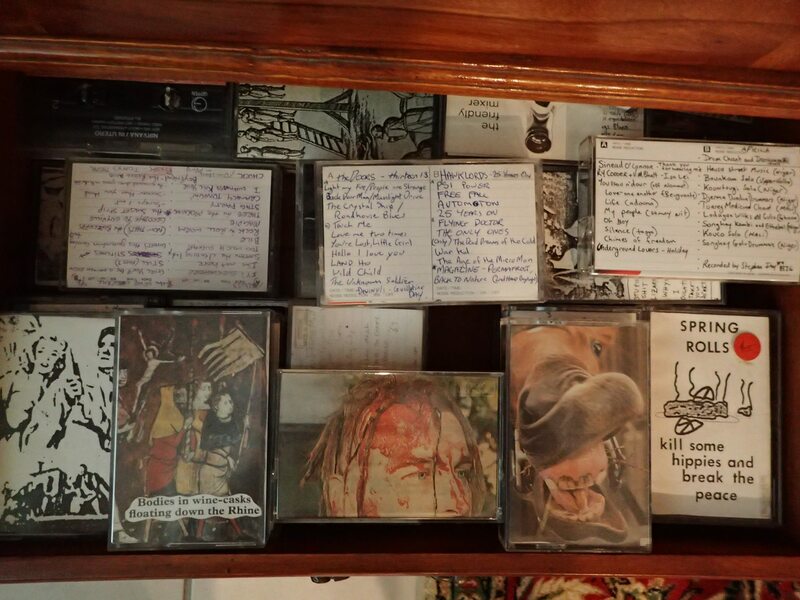 I purchased my tapes in my late teens and early to mid-twenties. Between 2011and 2017 I was a little kid when cassettes phased out, but I still remember mum having them and I had Disney storybook cassettes as a kid. Nice, I also had Disney cassettes as a kid. I had the whole audio of “The Jungle Book” film, so I know it nearly by heart now. Do you still have these cassettes with the storybooks? No way! those Disney tapes are long gone – presumably lost in one of many house moves! The green ones are blanks that I recorded some of my records on. I bought them on eBay in 2016. Ok! So you mean that you recorded your own music on them? So you’re a musician? Or, as other people, you record CDs into cassettes sometime? No, I just recorded some vinyl records to play on my walkman! Kierain Geaney is a music collector from Oakleigh South, Victoria. He’s the only one among his friends who have tapes. 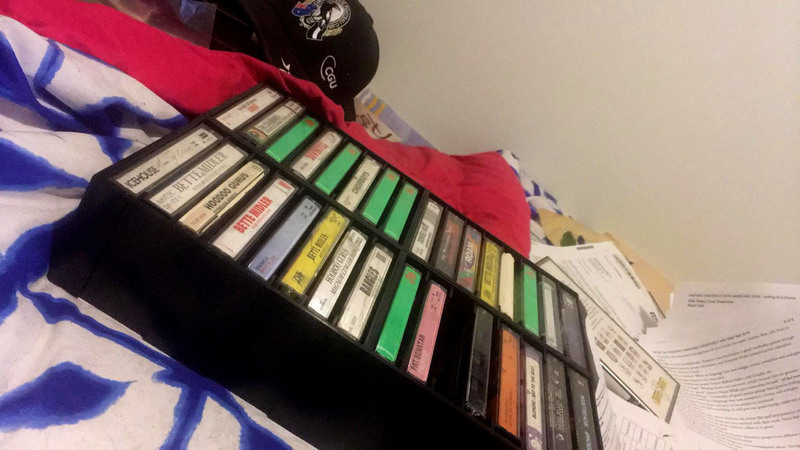 Cassette Hoarders United is a Facebook Group created to give an opportunity to share pics and info of cassette collections, such as the ones somebody may want to hunt down, or even just to share internet pics of any interesting cassettes.